Geoff Thompson is the new chairman of England's 2018 World Cup bid after David Triesman's resignation. 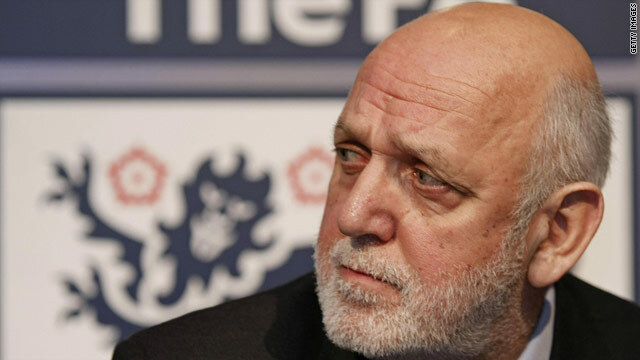 Russian officials described Triesman's claims as "totally absurd"
(CNN) -- Geoff Thompson has been appointed chairman of England's 2018 World Cup bid as the Football Association (FA) embark on a damage limitation exercise in the wake of David Triesman's resignation. Triesman was forced to step down from the post after an undercover taped conversation came to light in which he alleged that Spain and Russia were planning to bribe referees at this year's World Cup in South Africa. He also resigned as chairman of the Football Association. FIFA have now confirmed they have sent a letter to the FA asking them to prepare a report on the matter for their Ethics Committee. The Mail on Sunday newspaper reported the conversation that led to Triesman's departure just 48 hours after he had been part of the England delegation that handed their official 2018 bid document over to FIFA president Sepp Blatter. The paper claimed Triesman suggested that Spain may withdraw its bid to stage the 2018 finals if Russia -- which also wants to host the tournament -- helps it bribe referees in next month's World Cup. The FA were quick to distance themselves from Triesman's comments and appointed Thompson on Sunday evening. A statement on their official Web site read: "Following the unanimous approval of the Football Association Board, Geoff Thompson has been confirmed as the new Chairman of England 2018. "Thompson, who is a Vice President on both the FIFA and UEFA Executive Committees is England's most senior international football administrator." Of the taped conversation Triesman said in a statement: "The views expressed were not the views of the 2018 Bid board or the FA. A private conversation with someone whom I thought to be a friend was taped without my knowledge and passed to a national newspaper. "In that conversation, I commentated on speculation circulating about conspiracies around the world. Those comments were never intended to be taken seriously as indeed is the case with many private conversations." Russian officials decried the "totally absurd" allegations. "We are always playing a fair game, following the FIFA ethical rules," Alexei Sorokin, general director of the Russian Football Union told Sport-Express, Russia's leading online sports news agency. "This is not the first attempt at compromising us. But only a strong competition is feared, which means that our bid is being taken very seriously. We will pursue our chosen path and will continue our fair competition for the 2018 World Cup bid."